On arrival, you will be transferred to the Grand Hotel for two nights. 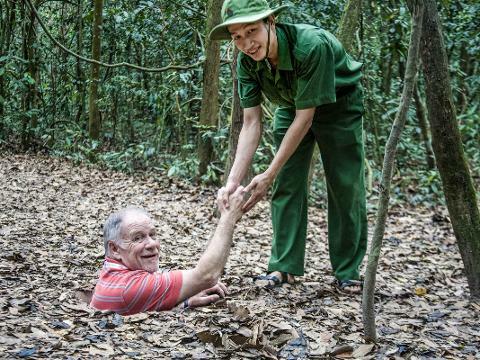 Today you will travel to Cu Chi Tunnels. Constructed by Viet Cong fighters during the Vietnam War, these tunnels ran directly under military bases and were used both as shelters and to stage surprise attacks. This afternoon, visit to the Reunification Palace, History Museum, the Notre Dame Cathedral, the Central Post Office, Opera-House, City Hall, Dong Khoi Street and Ben Thanh Market. This evening enjoy a relaxing dinner cruise. 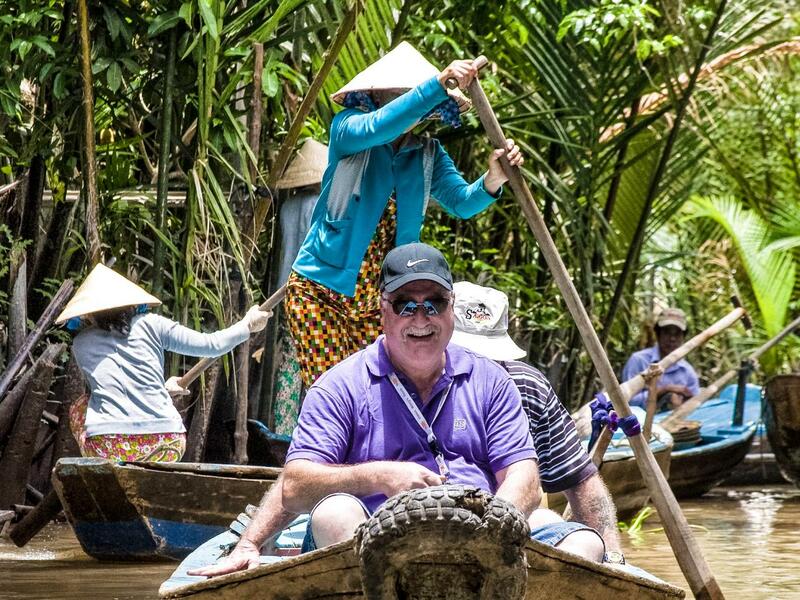 Spend a day exploring the colourful floating markets and lush back waterways of the Mekong Delta. 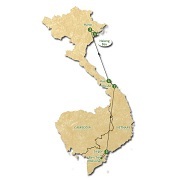 Journey to Cai Be and Vinh Long, walk to the villages and visit to some local home factories. Discover the stunning landscapes as you sail along the river and observe the typical Mekong Delta rural life. Continue to Can Tho and stay one night at the Victoria Can Tho Hotel. Early this morning, take a boat ride to the bustling floating markets of Cai Rang where countless boats, loaded with local produce, are moored alongside the riverbank ready for trading. Sail through the markets and watch the locals haggle and trade their wares to interested buyers. A stop will be made at the vibrant tropical fruit gardens before returning to Saigon and stay one night at the Grand Hotel. Transfer to the airport for your flight to Danang. 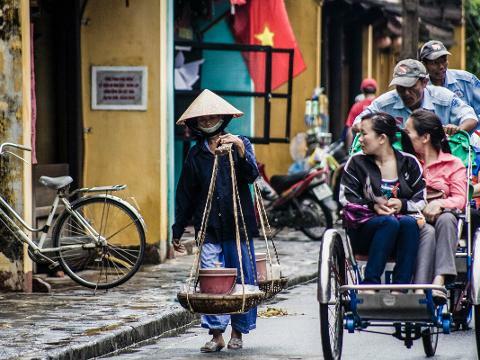 On arrival, travel to the charming town of Hoi An. Along the way, stop at Non Nuoc Beach, Marble Mountain and visit the Cham Museum, Stay two nights at the Hoi An Historic Hotel. This morning transfer to the airport in Danang for your flight to Hanoi and stay one night at the Ann Hotel. Lunch will be at KOTO Restaurant. This afternoon visit the History Museum and the Temple of Literature which was the first university in Vietnam. 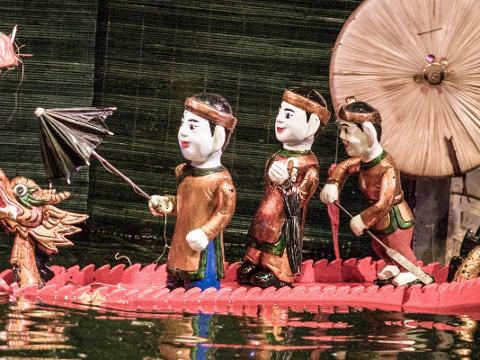 Enjoy an evening at the Water Puppet Show. Travel to Halong Bay via the rich farmlands and villages to join your overnight cruise on board the “Indochina Sails” junk. Observe the natural beauty of the unique grottoes that rise towards the sky as you leisurely sail the emerald green waters of the bay. Watch the sun rise over the bay before your return to the pier and transfer back to Hanoi. Stay two nights at the Ann Hotel.